People tend to throw in the towel on healthy eating around the holidays. For some it may start as early as Halloween with all the tempting candy, but for many the feasting often starts around Thanksgiving and just carries through to the New Year. We understand that leftovers, comfort foods, holiday parties and last-minute gift buying doesn't leave much time for healthy eating and exercise. That said there are ways to start off the New Year without having to resolve to lose the weight gained during November and December. 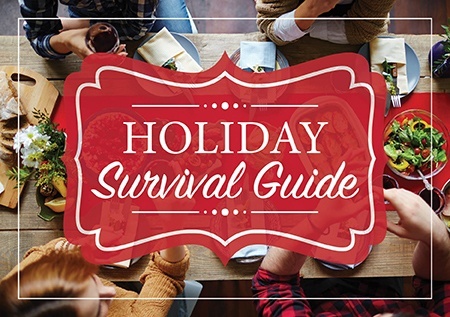 Here are some simple tips to navigate your holiday season successfully. Determine what events are likely to trip you up and plan your strategy in advance. This might include avoiding alcohol, sticking to lower-calorie appetizers, bringing a dish you know you can eat or just keeping portions small. This will prevent you from going overboard. Don't be afraid to taste things without finishing them. Consider having a Zone snack just before a party to reduce your appetite later on. Vowing to eliminate sweets or avoid tempting carbs may sound good in theory but can be brutally hard once you're at an event. Many people lose weight and keep it off with the simple strategy of portion control. Eat reasonably small portions, limit the foods you know you should limit, and don't stuff yourself. Most of us know our "trigger" foods, those foods we just can't seem to control our intake of. They are so yummy yet lead us to feel guilty, tired, low energy, and wanting more. Abstaining from them all holiday season is unlikely, but keeping their intake to one or two events versus repeatedly throughout the season allows for a balance between moderation and overindulgence. The "on"/"off" diet mentality can get us in a lot of trouble. Why? As soon as you go off diet, you give yourself permission to go from a taste of the pie to eating the whole thing. Don't set yourself up for disaster. Try to eliminate the all-or-nothing mentality by keeping portions small and indulgences in check. Having small meals throughout the day helps stabilize blood sugar levels. Skipping meals in an effort to bank calories for later sounds good in theory, but this leads to greater consumption and overeating. By keeping your blood sugar steady throughout the day, you'll be surprised at the willpower you have to avoid tempting foods later. No time for meal prep? Substitute a meal with a ZoneRx shake to help reduce calorie overload later or eat a ZoneRx bar before going to a party so you are better able to control hunger and temptation. A full salad-size plate looks like a lot of food and psychologically "feels" the same way. You can always go back for seconds or even thirds but doing so slows down the eating process, giving you more time to feel full. Or, if you do use a large plate, fill 2/3rds with vegetables. If you pop something pickled or spicy in your mouth, you may find your cravings for sweets diminish. It's okay to indulge in the occasional sweet craving, but eat something spicy or pickled first, and you may find you no longer want to. Often times water is replaced by caffeine around the holidays, leaving us mildly dehydrated and thinking we want food when in actuality we're just thirsty. Drinking water before a meal significantly curbs how much food we consume at the meal, so drink up! A slice of orange, lemon or lime will flavor the water and cut your cravings; flavored non-caloric seltzers accomplish the same thing. A simple walk can be just the thing to increase your energy, reduce stress, and get your blood flowing. By being active in the morning, you'll improve your insulin sensitivity, making your body more ready to handle the calorie onslaught later that day and also eliminate some of the holiday stress. While the holidays get crazy, try and keep as close to your usual eating routine as possible. Grocery shop on the weekends so you have meals for the week, pack your lunch for work, and have your usual breakfast and snacks with you for when you're on the go. This will allow you to have energy to keep up with the holiday excitement, while keeping your waistline in check by limiting the amount you have to eat out. We understand that it may be difficult to avoid dessert altogether, so pick one and keep the portion small. One slice of pecan pie can be as much as 500 calories whereas pumpkin is around 300. Want to save some calories and carbs? Skip the crust. For example, if you like pumpkin pie eat the custard portion and skip the crust and whipped cream topping. Eating slowly, putting your fork down between bites, and tasting each mouthful is one of the easiest ways to enjoy your meal and feel satisfied with one plate full of food. Choosing fruits, vegetables, broth-based soups, salads, and other foods with lots of water and fermentable fiber add to the feeling of fullness. Spread out the food and fun all day long. After a big holiday dinner, consider serving dessert after a post-dinner group walk. When you sit down at your holiday meals and events reach for the green vegetables first. These vegetables are rich in fermentable fiber so they help slow down digestion filling you up sooner. They are also low in calories and good for your gut too! Try broccoli, spinach, green beans, or any other non-starchy vegetable. Be careful of cream and/or fattening sauces with your veggies or substitute a heart healthy fat instead like Zone Extra Virgin Olive Oil. Check out the video below to help out with your holiday side dishes.